Freaking out about over eating or over indulging this silly season? Events are in their peak and they do not mean that you have to be bloated or loose your healthy habits. 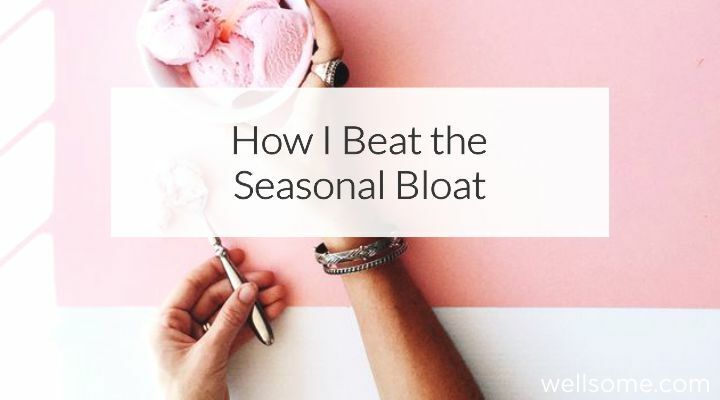 Here’s how I personally beat the seasonal bloat every Christmas. Be Prepared. When you know where you’re going and what you’re doing. i.e. drinking and eating care for yourself enough to prep. Stay hydrated drinking water, especially the morning of your event and 30-60mins before eating. Eat before the event. Just because you know you’re having a large lunch or dinner doesn’t mean starving yourself until then. When you do this you’ll simply get to lunch/dinner and overeat. Eat balanced meals and pack it with colour; veggies and fruit. Learn how to do so here. Don’t forget your Protein. Add protein to your meals earlier in the day with a protein snack or smoothie it’ll help keep your engine going, which means more balanced choices. Choosing your food; make sure it’s colourful and choose the healthiest choices available to you. Avoiding sugar, fried and super heavy meals. With meats, roasted, grilled are great options. Laugh!!!! A-ma-zing for digestion, mini ab work out and have fun! Plus, laughter is one of the best medicines. Have a tea with peppermint, chamomile, ginger or lemon. Feel like you’ve pigged out? Go for a walk or move your body in some way. Dance, walk, swim, bike ride. This will assist in digestion. Grab more tips on Surviving the Silly Season here.